Trumping Qwest again in the bidding for MCI Inc., Verizon said Monday it has raised its offer to at least $8.5 billion in cash and stock, and MCI's board is recommending approval of the new proposal to its shareholders. The higher payment from Verizon Communications Inc. is more than $1.3 billion below the $9.85 billion bid that Qwest Communications International Inc. has offered and which MCI was poised to endorse had Verizon not offered more by the end of Monday. This is the third time MCI's board has agreed to a lower-priced offer from Verizon, a decision the directors have justified by pointing to Qwest's heavy debt and uncertain business prospects. Denver-based Qwest did not immediately comment. "From the standpoint of risk versus reward, Verizon's revised offer presents MCI with a stronger, superior choice," MCI Chairman Nicholas deB. Katzenbach said in a statement. "Shareholders receive enhanced value with greater assurance that the transaction will create additional shareholder value." It is far from certain, however, that the three-month bidding war is now over. To begin with, major MCI investors holding a sizable number of shares have publicly said they view the Qwest bid as superior and would vote against a lower-priced deal. Qwest also may be willing to boost its offer yet again, a person familiar with Qwest's plans said Sunday on condition of anonymity. At least four more MCI investors have offered to help Qwest fund its bid, this person said. In raising its bid to the current level, Qwest received $800 million in cash guarantees from MCI investors. MCI, based in Ashburn, Va., has been hit hard by competition and a bankruptcy brought on by the WorldCom scandal, but still possesses a valuable customer base and national fiber-optic network. Both MCI and New York-based Verizon stressed that their merger will protect the interests of MCI investors by providing greater comfort for MCI's valuable base of corporate customers. "A large number of MCI's most important business customers had indicated that they prefer a transaction between MCI and Verizon rather than a transaction between MCI and Qwest," MCI's statement said. "Additionally, as their contracts come up for renewal, a number of customers have also requested rights to terminate their arrangements with MCI in the event of a Qwest transaction. These customer concerns, in the board's view, pose risks in connection with a Qwest transaction." Under the sweetened deal with Verizon, each MCI share would be exchanged for cash and stock worth at least $26. Qwest has offered $30 in cash and stock. The latest Verizon bid includes $5.60 in cash, the same as in its prior bid of $23.10 per MCI share, plus Verizon stock worth at least $20.40. Specifically, MCI investors would receive at least 0.5743 of a Verizon share for each share of MCI, an amount roughly equal to the $20.40 at Verizon's current stock price. Under a price protection feature, should its share price decline before the deal closes, Verizon may elect to pay additional cash instead of issuing added shares over the 0.5743 exchange ratio. The new deal comes slightly more than a week after MCI declared the previous Verizon deal inferior to the Qwest bid, but stopped short of accepting that offer. 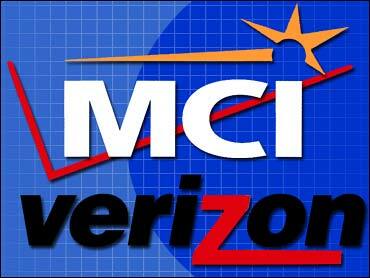 Under the terms of the Verizon deal, MCI was obliged to give Verizon a week to respond with an improved proposal. Qwest has said its offer will be withdrawn at midnight on Monday night if MCI's board does not officially switch its support away from a deal with Verizon by that time. It was unclear Monday whether Qwest would follow through on that deadline.